The Picts? Think of the confederation of tribes that came together to oppose the Romans, then occupied the central and eastern parts of Scotland north of the Forth-Clyde line for several hundred years after the Romans' departure. They were converted to Christianity in the century following a visit by St Columba in 565. After about 850 the Picts were slowly incorporated into the Scots Kingdom of Alba under King Kenneth MacAlpin, and over time their separate identity was lost to that of the Scots. Find out more from our Historical Timeline. We know most about the Picts from the carvings they left from the period between the completion of their conversion in about 650 to their eventual assimilation into Alba. These can be seen dotted spectacularly across much of the eastern side of Scotland north of the River Forth. 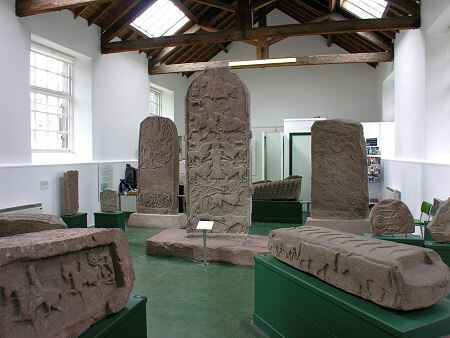 One of the largest collections of Pictish Carved Stones in Scotland is gathered together in the Museum in the old schoolhouse in the village of Meigle, in Perthshire. This can be found between Forfar and Coupar Angus on the A94. 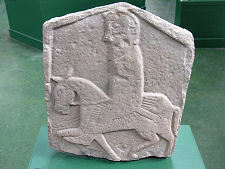 Meigle was a centre of some importance in the Pictish world, and was possibly associated with King Pherath (or Uurad) who ruled Pictland from 839 to 842. Whatever the reason for their being concentrated here, most of the stones in the Museum came originally from the churchyard behind the old schoolhouse. Meigle Church as seen today dates back only to the 1870s. A series of earlier churches has been built on the same spot, to avoid disturbing the graves. When the church built in 1793 burned down in on 28 March 1869, at least one stone stored inside was destroyed. 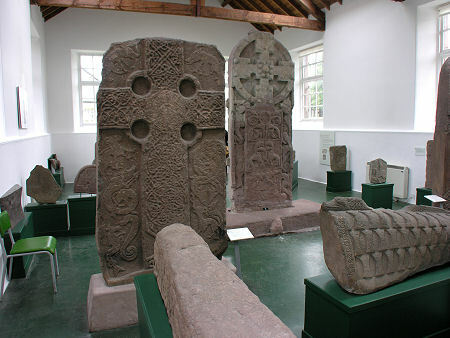 But other previously unknown Pictish stones that had been built into the structure of the earlier church(es) emerged during the rebuilding process. 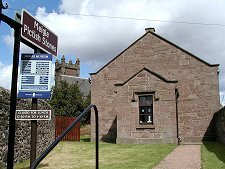 The old schoolhouse was purchased by Sir George Kinloch in the late 1800s to house the stones, and the collection was passed into the care of the state in 1936. The museum opened to the public in 1949. Today it is looked after by Historic Environment Scotland and what you find is a welcoming and well-lit space that shows the stones to extremely good effect with the minimum of distraction. Every stone at Meigle has its own story to tell, and the excellent guide book describes those on display in detail. Three large cross-slabs (stone slabs with crosses carved on their front faces) dominate the museum. The most spectacular is Meigle 2, towering 2.5m above its base. This originally stood near the entrance to Meigle Churchyard and has an imposing cross carved into its front face. In many ways, however, its rear is more interesting. 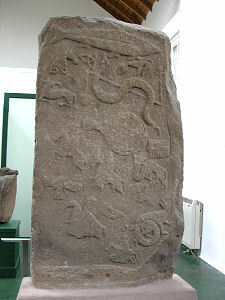 This contains a series of figures, mostly on horseback at the top, and of mythical animals at the bottom. 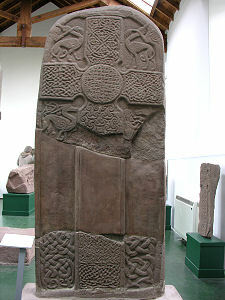 In the centre of the rear of Meigle 2 is a panel that has been interpreted at least two ways. 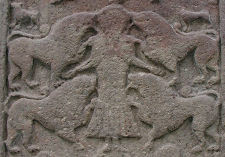 The straightforward view is that it is a picture of Daniel surrounded by four lions. A more fascinating interpretation is that it is a picture of the execution of Vanora, or Queen Guinevere, of Arthurian fame. The story goes that Guinevere was kidnapped by Pictish King Mordred, and held near Meigle. When she was released, it is said that King Arthur had her put to death by being pulled apart by wild animals, and her remains were buried at Meigle. The carvings are a little faded, but sadly they do look much more like lions than anything likely to have been found in Pictland. 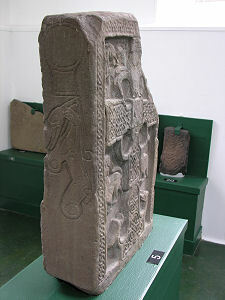 The earliest of the stones is probably the one knows as Meigle 1. This seems to have been a re-used ancient standing stone, and there are still traces of prehistoric cup-and-ring marks near the base of the rear of this stone. 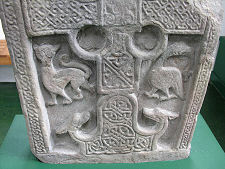 An ornate cross is carved onto the front of the stone, while the rear carries a very jumbled collection of Pictish symbols including horsemen and a fish, a snake, and a mirror. 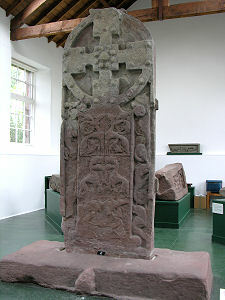 The third of the large cross slabs is Meigle 4 which has been reconstructed from pieces recovered after it was used in building work. 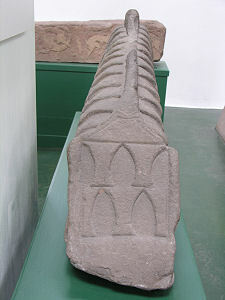 While the three large cross slabs probably intended to act as the focus for public worship do stand out, most of the stones at Meigle were intended to be individual grave markers, and they come in a variety of shapes and forms, ranging from small cross slabs through recumbent gravestones (intended to lie on top of the grave) to the rather later "hogback" grave marker designs that came into fashion at the end of the 900s. If you have any interest at all in this little understood era of Scotland's history then a visit to Meigle is highly recommended. The collection is remarkable, and the museum shop, though occupying only a small corner, offers one of the best collections of relevant books to be found anywhere.